The Illinois Bicycle Lawyers at Keating Law Offices recently settled a claim on behalf of a bicyclist struck by a motorist on August 5, 2012 in Chicago, Illinois. On the date of the collision, the bicyclist was riding eastbound on West Diversey Avenue when she was struck by a motorist traveling in the same direction when the motorist attempted to turn right across the bicyclist's path to enter the I-94 East onramp. Due to the impact, the bicyclist crashed into the pavement and was knocked unconscious as well as suffering multiple other abrasions and deep tissue injuries to her body. Upon regaining consciousness, the bicyclist was transported to the emergency department at Norwegian American Hospital before the police arrived at the scene. Moments before the bicyclist was taken from the scene of the collision in an ambulance, the responsible motorist provided what turned out to be fake contact information to the injured bicyclist. At the emergency room, the bicyclist was diagnosed with numerous injuries requiring months of physical therapy and chiropractic care. The bicyclist retained the Illinois Bicycle Attorneys at Keating Law Offices to represent her within days of the collision. For nearly a year, we worked tirelessly exploring numerous avenues to determine the true identity and contact information for the responsible motorist. After significant efforts that included contacting the Illinois Secretary of State and utilizing a private detective service, we located the motorist during the summer of 2013. After locating the true whereabouts of the motorist we then contacted multiple insurance companies to find out if he was one of their insureds. Ultimately this persistence paid off and the actual insurance company was located. Following negotiations with the insurance company, the Illinois Bicycle Lawyers recently reached a very favorable settlement on the bicyclist's behalf that paid for all of her medical treatment and compensated her for her pain and suffering. This case highlights the significant importance of remaining at the scene of a collision until law enforcement arrives whenever it is medically possible. The most reliable way to obtain the true identity of a responsible motorist is to get documented proof at the scene of the collision. Without the identity of the responsible party, recovery from that party's insurance company is extremely difficult. Fortunately, we were able to determine the true identity of the responsible party in this case after numerous attempts and significant delay, but all too often clients receive inaccurate information at the scene and are left without a source of recovery. However, if ever faced between getting medical treatment and staying at the scene, always take care of yourself and get medical treatment first. 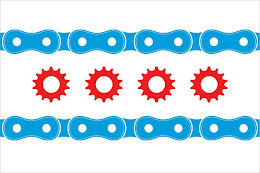 Keating Law Offices is the premiere law firm handling bicycle-related cases in Illinois. The firm is committed to the representation of bicyclists who have been injured as a result of the negligence of others. If you have any questions regarding this post or an issue involving Illinois personal injury law, please contact Illinois Bicycle Attorney Mike Keating at 312-208-7702 or MKeating@KeatingLegal.com 24 hours a day, 7 days a week. All e-mails and phone calls are returned promptly. All initial consultations are confidential and free.